by Sarah - March 6th, 2014. Filed under: New Products, Suttons Seeds. Herbs are a welcome addition to any garden, but they will grow with equal success in pots on sunny windowsills, in window boxes, and in tubs on warm patios. Plus they are easy to grow. 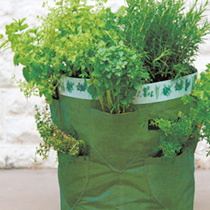 You will receive 12 herb plug plants (2 each of 6 different varieties) and 2 planters:Chives – Onion-flavoured, tender, spear-like green leaves. Delicious in all egg, potato and cheese dishes, as well as in salads, and on soups and potatoes.Parsley – A ‘must’ for the herb garden, producing strong-growing plants with dark green, densely curled foliage. Ideal for pot growing as well as in the garden.Lemon Basil – Strong lemon fragrance provides a delicious alternative seasoning for rice, fish, poultry and steamed vegetable dishes.Mint – Useful in sauces and jellies, and with peas, beans, carrots, beetroot, potatoes and spinach.Thyme – Excellent used sparingly with poultry, meat and game, and in soups. Small scented leaves.Coriander – Feathery with clusters of spicy seeds and used in curries and casseroles, and may be ground over lamb and pork.PLANTERS – Have a decorative motive around the top edge and pockets around the side. Ideal for small and urban gardens, patios, balconies and can be easily moved by using the handles on each side. Made from a high quality polyethylene, with brass drainage holes around side and base. Height 45cm; Diameter 35cm.